For A Fun Summer Baby Shower! Looking for Printable Pool Party Invitations for your Summer Baby Shower Splash? Easily create a unique and awesome baby shower invitation design using any fun Summer Themed card. Make it easy on yourself by personalizing your invitations with Baby Shower wording and having them printed for you. They even send them out for you! Or, save time and shipping & handling costs by printing them yourself. Either way is a huge savings of money & time! Print Your Baby Shower Invitations at Home ... So Easy! "Why Didn't I Do This Before!" It's so easy. Just think about it ... convenience, price, instant download right at your own home. And the Best part is you get to keep every single thing forever! Once you place your order, all of your purchased items land in your email inbox within seconds. That's it, no waiting, no shipping costs, no extra fees. Now, how great is that! Plus, print as many as you need, whenever you need them, all for one low price. Use them over & over again. Let's face it ladies, we all have the honor of being a baby shower hostess more than once, right? So, let's take advantage now and stock up with everything you know you'll need later on. These warm bubble-like circles create the perfect theme for any Summer Baby Girl Shower. This style is also available for boys (see below). Because the new arrival is sure to be "Cute as a Bug" these invites will light up your guest eyes. Perfect for a Spring or Early Summer Shower. 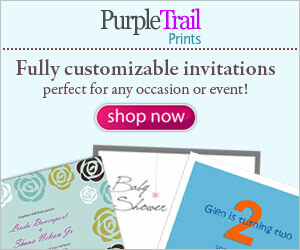 View their entire baby shower invitations and thank you's line at PrintablesAtoZ.